The macaw is a type of parrot native to the Americas. Famous for their vibrant plumage, these animals are considered to be among the world’s most beautiful birds. The scarlet macaw, blue and gold macaw and hyacinth macaw are particularly prized. In the wild, macaws prefer forests or savannas. They are native to southern North America and northern South America, including Mexico, the Caribbean and Central America. Size: The macaw is a large bird; the scarlet macaw is known to reach lengths of up to 36 inches and weights of up to 2½ pounds. Plumage: Colors range considerably from macaw variant to macaw variant; the feathers can be mainly of a solid color, usually blue or scarlet, or the crest can be a different color than the rest of the body. An orange or gold crest with purple or blue wings is a common configuration. Their faces are often flecked with white patches, and the feathers of their tails and lower wings often display color variations compared to the predominant hue of the body plumage. Song/Chirp: In their natural habitats, macaw parrots use screams and squawks to communicate and identify one another. Captive pet macaws retain this vocabulary, and some species can also be trained to mimic the human voice. Toys are vital to the happiness of pet birds. These types of bird toys will ensure your feathered friend stays occupied and entertained while in its cage! 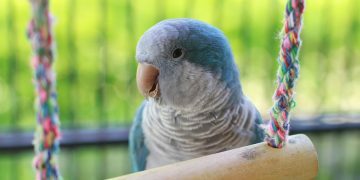 Intelligent and social, every variant of this parrot, from the mini macaw to the blue and gold macaw, is a flock bird by nature. They enjoy the company of other macaw birds as well as humans. Being intelligent, they also need plenty of attention and a good selection of bird toys to amuse themselves. Feeding: You must replicate the type of diet these birds would eat in the wild to give your pet optimal health. Fruits and seeds comprise a large portion of their diet, especially hard seeds that deliver high levels of protein. Choose a high-quality bird feed and dietary supplements with the input of pet store staff or an avian veterinarian. Grooming: As with most birds, the grooming needs of the macaw are limited. Provide your bird with clean water to bathe in, and trim its nails when they get too long. Macaw parrots also need their beaks culled when they get too long, a task which should be performed by a professional since vital blood vessels lurk nearby. You can help keep their beaks in shape by providing wooden toys, which will naturally keep beak growth in check. Health Concerns: Young birds can suffer from fungal, bacterial and yeast infections. Ward off potential sinus problems by moderating humidity levels in your home, and keep in mind that excessive amounts of Vitamin A can lead to liver problems or failure. Breeding macaws should be thoroughly inspected by a vet for any diseases before mating begins; sick birds should not be used for breeding. Life Expectancy: These birds live an average of about 50 years, though some have been known to survive to be as old as 80. You’ll find that most mature macaws for sale cost quite a bit of money. 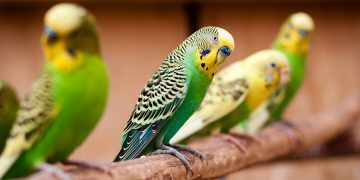 These exotic birds, given their large size, are also relatively expensive to maintain, requiring large cages, a high volume of food and specialized toys to play with. 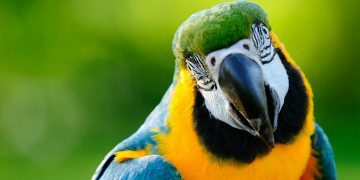 Expect to pay anywhere from about $500 to $900 for a healthy macaw pet, though prices may vary according to the age of the bird, its plumage, its intelligence and its pedigree.